ituated along the ever-growing H Street, 1115 H is a newly developed mixed-use project placed between 11th and 12th Street on the H Street Corridor neighborhood of Washington, DC. Delivered in 2014 and designed to achieve LEED Platinum certification, the five-story building is not only notable for its fabulous address but for its energy efficient and environmentally friendly features which include a green roof and triple-glazed windows. 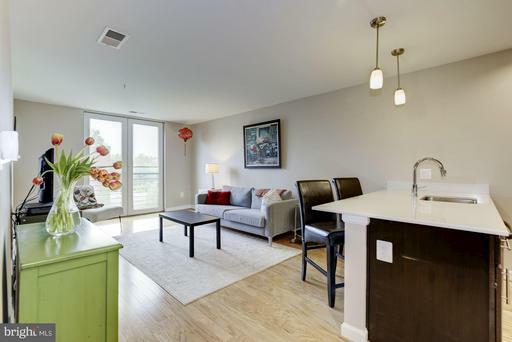 Other interior finishes found at 1115 H include hardwood floors, generous layouts with spacious bedrooms, plus gourmet kitchens tricked out with stainless steel appliances and granite countertops. A new Whole Foods is being opened just a few blocks away, while residents will also have direct access to numerous local restaurants and entertainment venues located along H Street Corridor. Little Miss Whiskey’s is across the street and is a notable watering hole in the area. A hip, quirky and cash-only venue, LMW offers a lounge-like atmosphere with an extensive beer list, dancing, and New Orleans Saints games on the TV. The Queen Vic is a dark-wood, Old English pub with traditional British menu while Biergarten Haus is down the street and offers trademark beers and pub grub from Germany. Some eateries found here include Toki Underground, RedRocks, and Smith Commons—a tri-level bistro serving New American fare, beer, and cocktails. H Street also offers plenty of Metro bus stops as well as the newly arranged DC Streetcar which will take passengers directly to nearby Union Station. Traveling along the Red Line of the DC Metro system, Union Station is the most heavily used station in the district as it also houses an Amtrak, VRE, and MARC station. The MTA Maryland Bus and Loudoun County transit system also operates stops here, allowing wonderful access to Maryland and Virginia.